The bag pictured here can be purchased at the Express and can be used in the county of Amberg-Sulzbach. 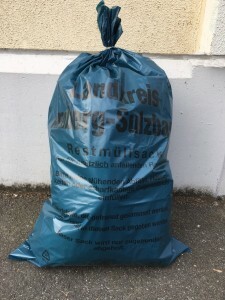 GRAFENWOEHR, Germany — In response to requests by community members, the Army & Air Force Exchange Service Express locations within garrison now sell trash bags specific to the local towns in the area. For those who keep battling with more trash than their curbside trash bins can hold, the Tower Barracks, Netzaberg and Rose Barracks Express locations sell trash bags specific to local towns within the garrison’s footprint. Trash collectors in Germany might not pick up your garbage, or Restmuell in German, if the curbside bin is overflowing. But county specific bags, which come at a fee, cover the cost and tell the trash collectors to go ahead and remove. If, for example, your refuse bin overflows and its lid does not close, the trash will not be picked up. The county considers it extra waste for disposal that is not paid for. One solution is to purchase county specific trash bags as now offered at the garrison’s Express locations. Those trash bags are specifically marked informing the trash collector that the extra waste disposal is paid for. “The Garrison Commander asked our GM (General Manager), Carl Carpenter if we could possibly carry the Restmuell (refuse) bags for Tower & Rose Barracks. Bags are at the registers. Customers just need to ask. Cost is $4.50 per bag,” said Chris B. Litch, Visual Merchandiser Manager, Grafenwoehr Consolidated Exchange Army & Air Force Exchange Service. The bags bought at the Tower Barracks and Netzaberg Express are only good for town and cities in the county Neustadt an der Waldnaab, including Netzaberg. The bags purchased at Rose Barrack’s Express can only be utilized in the county of Amberg-Sulzbach. For more on recycling guides, trash pickup schedules or trash policies, go to the garrison’s trash and recycling webpage at www.bavaria.army.mil/trash. You can also pick up all the SORT brochures and guides at the housing office on Tower Barracks, Bldg. 244, or the SORT office at Tower Barracks, Bldg. 329. If you have questions, call the SORT coordinator at DSN 475-6664, CIV 09641-83-6664.